Scissor lifts are commonly used aerial work platforms or elevated work platforms (which can be mobile) designed to lift an object or make it easy to work on something at height. It is likely that you have already seen this equipment once or a few times. This equipment only has one type of movement: vertical. It can only move up and down, powered by a hydraulic, pneumatic, or mechanical system. Some employ a mini power pack, which is a hydraulic system in a standard IEC frame with DC motors. There are five crucial parts of a scissor lift. These are the platform, scissor legs, hydraulic/pneumatic cylinder, motor/power source, and the base. The platform is the uppermost part of the lift, where a person or an object is positioned, to reach an elevation. The scissor legs are the X-shaped component underneath the platform partly responsible for the vertical movement of the platform. The hydraulic or pneumatic cylinder is what moves the scissor legs. The motor is what operates the hydraulic cylinder. Lastly, the base is the bottom part of the lift, holding everything in place. The base has parts through which the lower parts of the scissor legs slide as they move. In some cases, the base is a cart or truck, which makes it easy to move the lift to where it is needed. Complex scissor lifts capable of elevating their platform several metres up in the air need to have strong bases to make sure that they remain in place as the upper components move. Some may need to be fastened to a heavy and reliable platform or screwed to the ground. For scissor lifts that have carts or trucks as their base, it is important to make sure that the base is heavy and stable enough to support the weight the platform carries. The operation of a scissor lift is the result of a series of actions. The main parts involved are the power source or motor, the hydraulic/pneumatic cylinder, and the scissor legs. The motor or power source is the origin of movement. It supplies the power needed to activate the hydraulic or pneumatic pump, which in turn pushes out or pulls in a mechanical component in the hydraulic/pneumatic cylinder. This pull/push movement is what causes the scissor legs to move and propel the platform up or down. 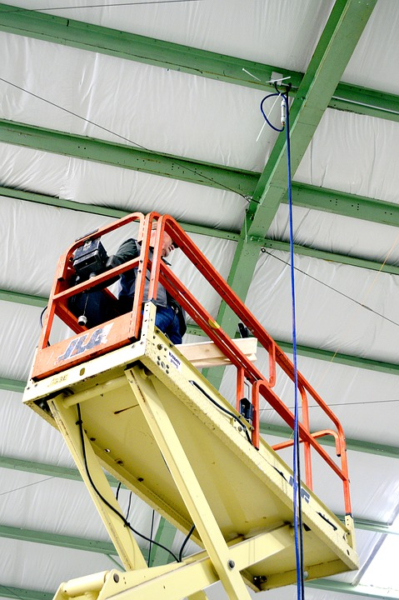 Most scissor lifts employ a hydraulic system. Those that are used in industrial applications involve one to three single-acting hydraulic cylinders. Hydraulic mechanisms are generally preferred because of their precise motion transmission. It is more efficient than pneumatic systems in transmitting energy. Additionally, hydraulic setups only require simple levers and push buttons to start, stop, and control the rate of movement easily. It is for these reasons that forklifts and bulldozers use hydraulic systems. It is advisable to know the basics of how a scissor lift works if you are planning to operate one. This knowledge helps you in using the equipment more efficiently and in properly maintaining it.